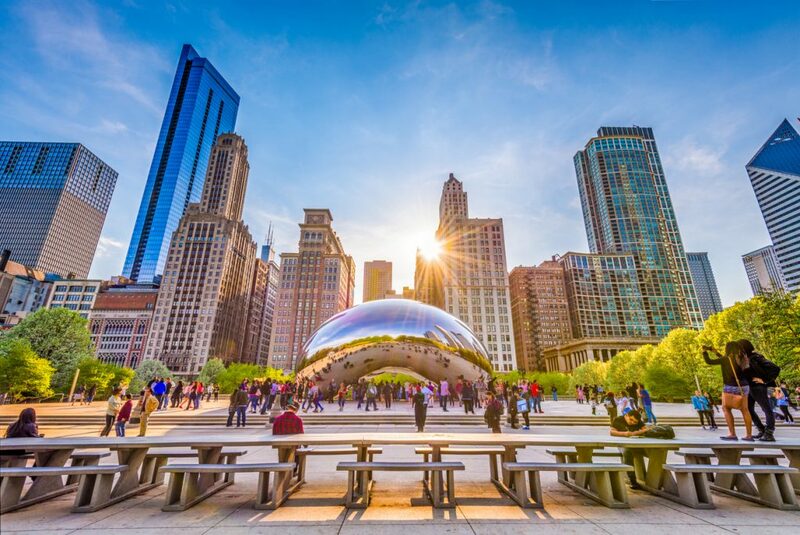 Though Chicago historically is known as the font of a distinctive strain of blues music, this gorgeous city on Lake Michigan has the venues (and artists and teams) to fill any length of visit with unforgettable entertainment, from a Bulls basketball game to a top-tier arena-filling concert blowout. Here’s what to know about the locations where you can take in whatever type of show you’re craving. HAPPY @NHLBLACKHAWKS HOME OPENER! Put a 🎈emoji in the comments if you’re watching the game tonight. Covering close to a million square feet, the United Center is the largest arena in the U.S. But in addition to being a winter-sports mecca — the Near West Side venue is home to the NHL‘s Blackhawks and NBA‘s Chicago Bulls, and the grounds boast statues of basketball legend Michael Jordan, as well as hockey greats Bobby Hull and Stan Mikita — the space has also hosted hundreds of superstar music acts since opening in 1994. In fact, the 23,500-capacity concert configuration draws only the most popular classic rockers, country icons, and pop queens. Just north of ever-bustling O’Hare International Airport in Rosemont is the Allstate Arena. Opened in 1980 as the Rosemont Horizon — the venue’s opening show was a Fleetwood Mac/Christopher Cross double bill — the space has since served as the home for a variety of local college basketball teams, along with Chicago’s WNBA and AFL franchises. Although the AHL’s Chicago Wolves currently call the Allstate Arena home, the space is also still known as a fantastic place to see a major concert, with its 18,500-seat capacity, proximity to freeways and public transportation, and dynamic booking practices. Acts gracing the arena stage cover the range all the way from Panic! At the Disco and Kelly Clarkson all the way to Michael Bublé, Eric Church, and Elton John. Originally named the Majestic Theatre when it opened in 1906, the Loop-located venue has hosted all kinds of entertainment in its century-plus existence. It was deliberately designed with rich colors and textures to attract a higher-class audience to its vaudeville shows, an aesthetic that lives on today. The 1,800-capacity theater went dark during the Depression, but in 1945 was rechristened the Sam Shubert Theatre and became a go-to stage for local high-profile musical premieres and pre-Broadway runs. Today, in partnership with Broadway in Chicago, the CIBC Theatre is known for its world-class productions. In fact, the CIBC Theatre serves as the Chicago headquarters for performances of Lin-Manuel Miranda’s Broadway sensation Hamilton. Nestled in the sleek River North downtown district between the famous Marina Towers (they’re the buildings pictured on the cover of Wilco’s Yankee Hotel Foxtrot album), this venue is one of the longest-operating House of Blues outposts, as it opened in 1996. With its gorgeous detailing and multiple tiers, the 1,400-capacity space is a go-to for artists of all genres (its name notwithstanding) and career levels: up-and-comers, mid-level stars, and seasoned veterans. For something even more unique, try the venue’s self-proclaimed World Famous Gospel Brunch on Sundays. Seeing a show at the Aragon Ballroom is like taking a trip back in time. The 1926-built Uptown venue still maintains the glamorous charm of its heyday, when it was a popular dancing destination, what with its sparkling chandeliers and colorful tiled walls, castle-like balcony flourishes, and fantastical night scene painted on the ceiling. The 5,000-capacity room is arranged in a spacious general admission configuration — get there early if you want to be up front — which provides a vibrant atmosphere for energetic rock bands, massive electronic ragers, and hip-hop acts. TONIGHT! To celebrate The Chicago Theatre's 97th birthday, we're hosting a special evening venue tour at 6PM complete with a live organ performance. Tickets are available at the door. With its dazzling light-up exterior marquee that spells out “Chicago” and lavish interior decor referencing iconic French architecture, this Loop venue remains one of the most unique places to see live music in the city. The 3,600-capacity space, which opened in 1921 as the Balaban and Katz Chicago Theatre and is on the National Register of Historic Places, was originally a movie theater. Over the years, it’s grown into a popular destination for stand-up comedy acts and children’s entertainment, in addition to musicians looking for a spacious stage. It’s played host to gritty blues-rockers, pop icons, indie rock’s biggest names, and country stars. The large outdoor Hollywood Casino Amphitheatre in suburban Tinley Park has gone by several names since opening in 1990 — previous monikers include World Music Theatre and the First Midwest Bank Amphitheatre — but what hasn’t changed is its status as a summer music hotspot. With its 28,000 capacity (11,000 reserved seats; the rest lawn), the space has hosted major traveling festivals and nearly every A-list superstar you can think of. You can probably scratch whatever music itch you have here: think metal kings, pop-rockers, and nostalgic bills ripe for summer memories for years to come. Heart, Joan Jett, and Cheap Trick tonight! Located near Chicago’s Museum Campus — home of the Adler Planetarium, the Field Museum of Natural History, and Shedd Aquarium — Northerly Island is in reality a 91-acre Lake Michigan-adjacent peninsula with park-like amenities and is an unparalleled vantage point for the city skyline. The FirstBank Pavilion leverages this unique space: with its combination of grandstand seating and a lawn area (which, for certain concerts, also has seats), the seasonal outdoor concert venue can have an intimate configuration or be festival-like, with a maximum capacity of 30,000. Appropriately, the space hosts classic rockers, R&B stars, jam bands, and everything in between, as well as extravaganzas like the three-day Country LakeShake country music festival. We would prefer a sheet of ice over the floor, but we will have to wait until October. If you’re in Chicago, hop on I-90 and head west about 90 minutes to Rockford, Illinois, hometown of Midwest rock ‘n’ roll heroes Cheap Trick and the downtown BMO Harris Bank Center. In the winter, the arena is the home of the AHL’s Rockford IceHogs hockey team, as well as events such as Disney on Ice presents Frozen. However, since a 1981 Rolling Stones gig, the space has also been a go-to for mid-sized music tours. With a concert capacity of 10,000, BMO is known for hosting all kinds of artists, including country upstarts or Christian acts. Every summer, thousands of people from all over the world flock to Grant Park, the bucolic lakefront home of the multi-day Lollapalooza music festival. It’s easy to see why: The 319-acre city park boasts gorgeous greenspace and Instagram-worthy spots — including Buckingham Fountain, which serves as Lolla’s main landmark, and the renowned, eye-bending “jelly bean” sculpture — in addition to smaller music pavilions and museums such as the Art Institute of Chicago, Adler Planetarium, and Shedd Aquarium. Grant Park’s proximity to the Loop and its expansive space make it ideal to showcase Lolla’s ever-vibrant, eclectic lineup of artists, which perform on multiple stages in the shadow of the Chicago skyline.